Dave first picked up a harmonica in February of 2009, and started playing with Oliver in 2012. He and Oliver co-founded Dry River in May of 2013. 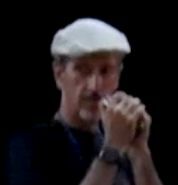 Dave’s main harmonica teachers have been the great players Jason Ricci, Adam Gussow, and Chris Michalek; with some important and highly appreciated input from four other terrific players: Brandon Bailey, Deak Harp, Zhin Wong, and Johnny Sansone. By and large, he prefers Suzuki Manji harmonicas, although he doesn’t use them exclusively. Most of the time, while playing out, he uses a custom hardwood mic from BlowsMeAway Productions, an MXR Carbon Copy delay pedal, and a Harp Break pedal from Lone Wolf Blues Co., usually plugged right into the PA.
Dave is from the Inland Empire. You can email him at daveforrest56 [at] gmail.com.